This book is in my TBR VO since its release in February 2016 and now that I read it I regret that I don’t read it sooner. It took me the French version to decide finally to read this book in VO, I know I’m weird but what do you want. Amani wants to flee her city in the desert for the capital because her uncle wants to marry her. As she knows how to shoot and defend herself she tries to earn money at shooting competitions, it’s to one of them that she meets Jin, a young stranger. They are pursued in the desert by the army of the Sultan and there follows an entire adventure. Amani is a person that I appreciate very much, she is independent and she knows what she wants, at times I found her reactions quite infantile and a little nasty. Mainly when Jin saves her life and she drugs him to escape with his mount and half of his money, leaving him alone. After I can understand that in her situation she doesn’t trust a man. We are still in a world where men have several women and women aren’t supposed to do anything other than look after the house. Jin is a rather mysterious character but he’s very interesting, I really liked him. He sees something in Amani that attracts him and makes him want to help her even if he knows that his path isn’t necessarily the one he would like her to follow. I find that their relationship is based on trust, it is acquired as the adventure progresses and I like their way of interacting both together. They protect themselves and I find it very beautiful. I also appreciate all the secondary characters we meet in the desert among the rebels. They are all very interesting and I hope that we will see them much more in the second volume. I enjoyed traveling through the desert and discovering a world different from ours, with endearing characters and a story that transports you to a wonderful adventure. The romance although present is very light and I am a little afraid for the second volume but I keep hope that Jin and Amani pursue their adventure together. 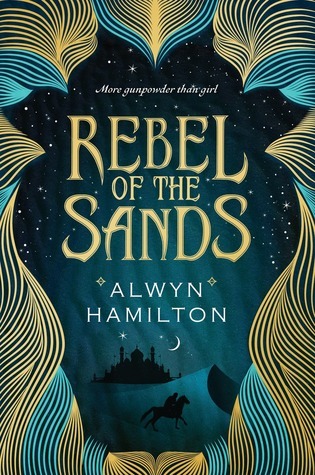 Rebel of the sands is very well written, the story is a fast reading because we want to know what will happen to Amani, I still have some outstanding questions and hope that they will find an answer in The second volume. Alwyn Hamilton makes her first book a nugget to have in your library and I’m looking forward to being in February to read Traitor to the throne in VO, and for this one I would not wait that long.